There is no need to adjust your set. Yes, you have read artificial ham flavor. It even sounds disgusting. Let's start from the beginning. We cooked a beautiful bone-in ham for New Years day. It was from the 'Meat Star' Dittmer from Dittmers Wurst Haus. It was scrumdiddlyumptious . Today we have a wonderful bone to make split pea soup. This is one of my favorite soups. Ms. Goofy is not partial to this green pea concoction, so I will enjoy it all week. I asked her to pick up a pound of dried split peas from our local Wally-Mart. She brought back this package of Hampeas. 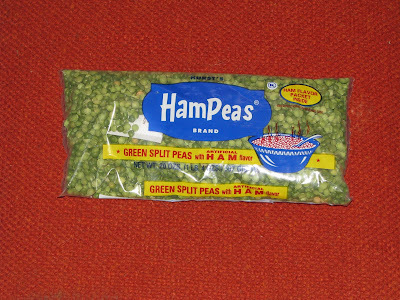 When did split pea get the name make over? After a brief observation of these fancy new dried legumes we noticed that this package came with a ham flavor packet. In fact, right in front, in plain English, it claims ARTIFICIAL ham flavor. Yuck!!! Luckily it came in a sealed package and I was able to remove it from the peas. The split peas soup is delicious. It is flavored with the most flavorful "Real Deal" ham bone. It will go perfect with a ham sandwich and a visit to the couch to watch more football. I've never seen artificial ham flavoring. Lucky for you it was in a separate package. My hambone is in the freezer, can't wait to make ham and beans. Go Broncos. Artifical ham flavoring: yikes! 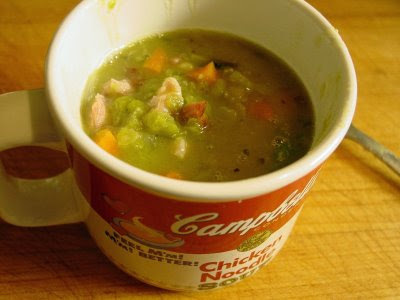 Who would go through the trouble to make split pea soup from scratch with dried peas but couldn't be bothered to use a real ham bone? Hmmm, I don't see any lard in your recipe, that ain't right. Some day, some day soon, you will try mine and come to the Lard Side. We didn't have a ham bone for our black eyed peas so I used to ham hocks instead. Wasn't bad at all. highlandsranchfoodie, Did you know your knee bone is connected to you ham bone? Robert, Thats what I talkin about. Yikes is right! Reverend, Did I ever tell you that you are the hambone inspiration of life snd meat. Bacon Brother, read the recipe. Chris, I did keep it and I will mail it to you when you send me your address. Scary stuff. Greg, Have you gotten into my fruitcake stash? Where art thou Lard? Please deliver the lard. What Chris said. Eek. Soup looks great, and I don't even love split pea soup! Never thought this world would ever need artificial ham, mine as well throw some MSG in there too, lol. Im with ya though split pea is pretty dang good. Ribsasmokin, Good luck with your new blog. Wow I feel very humble. Well, now I want split pea soup. And I don't have a ham bone. Maybe I'll try the little packet. Oh, no! I missed your offer! Bummer! Next time, you must email me or call me. My email address is PamelaHyland@comcast.net and if you send me an email I'll send you my phone number. Sorry I didn't check back sooner! which means it's probably better for you than the Goya Ham Concentrate (though, just using a good ol' ham bone would be best). Right. Soy-based "ham" flavoring is more disgusting than flavoring derived from factory farmed Wilbur flesh. Brilliant.